Google’s Gmail e-mail service is hugely popular, but online e-mail has some drawbacks. Perhaps the biggest is the fact that Web-browser-based e-mail just doesn’t work the same as a standard e-mail client. For example, clicking on an e-mail link in a Web page or in a document doesn’t open a new Gmail message window, and you can’t just drag a document to an icon in the Dock to attach it to a new message. Gmail lets you use POP or IMAP to access your mail using an e-mail client such as Apple’s Mail, but as Macworld contributor Joe Kissell explained in a recent TidBITS article, Gmail’s unique approach to message organization doesn’t mesh well with many e-mail clients. More important, using an e-mail client to access Gmail means you lose out on many of the features that likely made you a fan of Gmail in the first place—labels, conversation views, Google searches, Google Talk, and so on. A better alternative is Mailplane , a dedicated Gmail client. Unlike Mail or Entourage, Mailplane doesn’t access your Gmail account via POP or IMAP; instead, it uses the magic of WebKit—the browser code on which Safari is based—to give you the native Gmail interface in a standalone program. 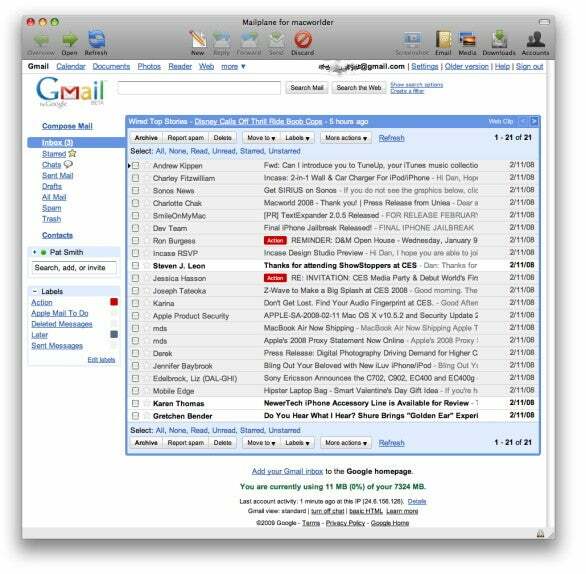 Provide your Gmail account and password to Mailplane, and you’ll see a standard Gmail screen within Mailplane’s window. Gmail works here much as it does in your Web browser; you can even use Gmail’s settings to change the theme and visible content. But Mailplane’s toolbar looks more like that of a traditional e-mail client, with buttons for Refresh, New, Reply, Forward, and more, and you can customize the toolbar with buttons for other Gmail features such as Google Talk. Mailplane also provides menu commands and keyboard shortcuts for most actions, and you can customize those shortcuts using OS X’s Keyboard preferences. As a standalone e-mail client, Mailplane also supports standard OS X features. You can set Mailplane—and, thus, Gmail—as your default client, so clicking an e-mail link in any program opens a new Gmail message in Mailplane. A plug-in for iPhoto lets you send photos from within iPhoto using Mailplane. Mailplane can notify you of new messages via its Dock icon, a menu-bar item, and audible alerts. And the program supports both Address Book for adding recipients and OS X’s media browser for adding photos and other media to messages. One of my favorite features is that you can set up multiple Gmail accounts in Mailplane; select one in the Accounts drawer and click on Switch To, and Mailplane logs you out of the current account and into the new one. (You can’t log in to two accounts at the same time, however.) I also like Mailplane’s keyboard navigation: press Shift+G and a Navigate box pops up; type enough of the name of a Gmail view or label to uniquely identify it, and then press return to jump to that view. You can assign labels to messages and conversations using a similar procedure. Mailplane has a few minor issues here and there, most of them apparently due to the fact that the program is stuffing a Web application into a Mac OS X program. But overall it works well, and it offers a good combination of the advantages of a standalone e-mail client with the features of Gmail. Updated 5/19/2009 2:30pm: Corrected the family-license price.